The other day, something happened by accident. I bought a doll. For myself. But then, as usual, things and life took over and although I had a passing love for the dolls, I did nothing about it. Until a few weeks ago. Have you ever been on the internet and found yourself overtaken by events and somehow shopping for stuff you never intended to buy? Usually for me, it’s holidays. I get carried away booking holidays online and shrug my shoulders when I think about how on earth I might pay for them. It’s always worked out, more or less. This time, I ended up buying a doll. Usually, the dolls are imported from Asia, in particular Japan, where the Junie Moon store lives. This doll was a mere hop over the Pennines. And she was customised. And that was it. I loved her straight away and, armed with money from my savings account ( so, please, don’t let the boiler blow up any time soon), I bought her. What I’ve realised since immersing myself in the world of Blythe is that the dolls are merely a conduit to many other things. People customise them, make clothes, take photos. 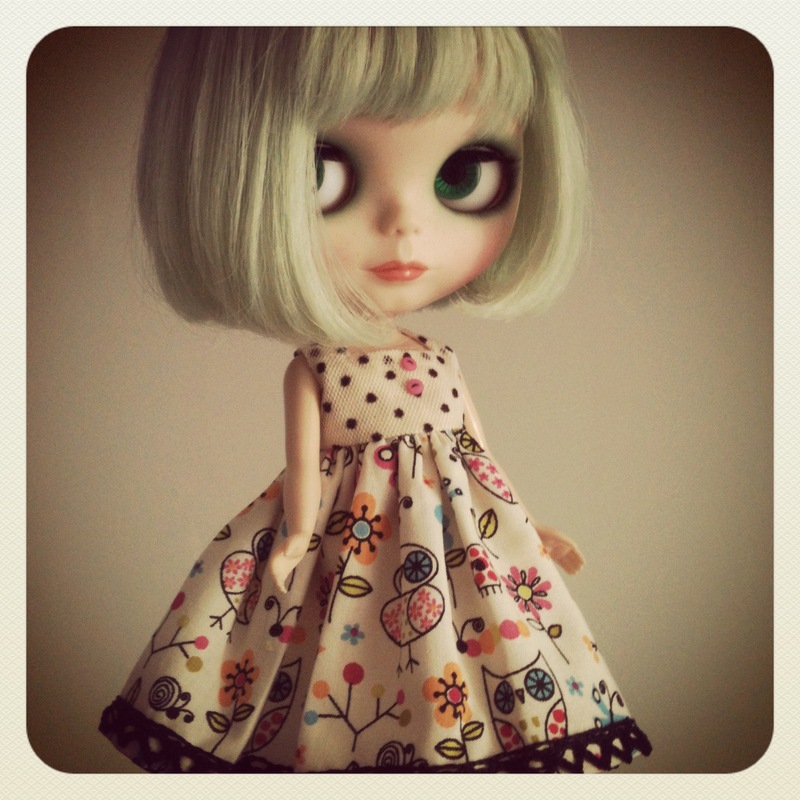 There are so many Flickr accounts for Blythe, they’re probably half the content! She’s the ideal model, given that she’s super photogenic and doesn’t pull faces, unlike my kids. You may think I’m too old to play with dolls. Perhaps I am. I’m also too old to be bullied or ashamed for it too though. Play, in all forms, isn’t just for kids. From computer games to model railways, football to dance, many of us have hobbies that are ‘play’, and why shouldn’t we? How many of you have wrestled the Lego from your kids, going ‘ no, no, you’re doing it wrong, let’s do it like this‘? Most of us would admit, that to a greater or lesser degree, that we feel as though we’re faking this whole ‘adulthood’ thing anyway, so I say, lets all just admit it, and play a bit more. My post the other day contained three things. A gas bill. A letter from the dentist. And a tiny,beautiful hand-sewn dress, bought from Etsy and sent all the way from Australia. I don’t care how old you are, post from abroad is exciting. In a world where we’re constantly bombarded with images of horrible happenings we can do nothing about, where we’re told there are no jobs, everything is doom and gloom and there is seemingly no light at the end of the tunnel, a little escapism in the form of play is exactly what is needed. I love that little frock!